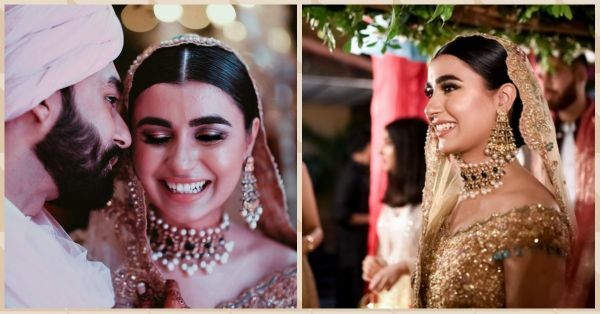 This Pakistani Bride In Gold Proves That Happy Brides Are The Prettiest! We've all seen iconic Bollywood wedding moments and fallen in love each time. From Kajol's iconic DDLJ and Kuch Kuch Hota Hai looks to Kareena Kapoor's in Veere Di Wedding and Alia's in Raazi. And we obviously think that reality won't compare to the sheer beauty and grandeur shown on the big screen. But that's where you're wrong. Meet Sona Menon, a stunning bride from Pakistan who we just couldn't look away from. She dressed up in a gold and grey lehenga for her wedding day but it was actually her radiance and sheer joy that made her look so ethereal. Whispering sweet nothings to his beautiful bride. She wore an outfit by Tena Durrani, a Pakistani designer and it was the perfect blend of bling and pastel. The lehenga was a tone of grey with golden detailing on it. The blouse was off-shoulder and had the same look as Bebo's in Veere Di Wedding. For jewellery, she went for a statement gold choker with pearls and emeralds and matching earrings to complete the look. Also, doesn't the groom, Taha Menon look absolutely dapper in that pink safa?! 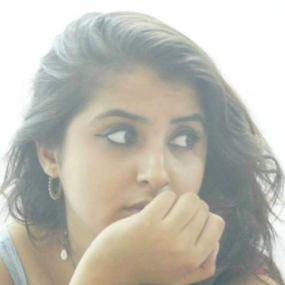 For makeup, she played to the desi strengths and kept her eyebrows as the main focus. She had a flawless base with the tiniest bit of blush and highlighter. She went for a winged liner, golden and brownish tones for the eyeshadow and full-on fluttery eyelashes. Finally, she topped it off with a pretty pink lipstick and a gloss on top. And..... here comes the bride. Just look at this happiness and loved the filled trailer! Even on the other functions, both the dulha and the dulhan looked beyond stunning. They danced, laughed and in all just had a blast at their wedding. We love us a couple who can kill it on the dance floor, ammirite!? Even the pre-wedding trailer and functions looked like a mixture of happy and teary moments. The song they used is Indian blogger, Masoom Minawala's mother's cover of the song Maaeri and it fit perfectly. All smiles for this glam couple.